This next car comes as a Columbus Day special -- because it is a proper boat you could use to explore regions unknown and enjoy the freedom that comes with a smooth ride and a huge gas tank. You could hide a few dozen bodies in the trunk if needed. 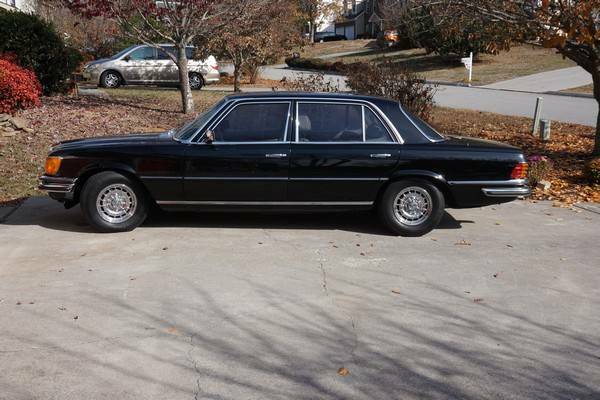 Find this 1977 Mercedes-Benz 450SEL 6.9 offered for $9,500 in Norfolk, VA via craigslist. Tip from FuelTruck. Moving & no room, CLEAN TITLE, CASH SALE. REDUCED BY 5.5k Well below all books. California car with extensive records since new. BLACK ON PALOMINO. EURO Headlights and bumpers, chrome bundt wheels. ORIG SPARE. Great, strong running, fast and solid car, over 6k in receipts in last 7 years by Larry's Imports. Ultimate Q-ship of the day. 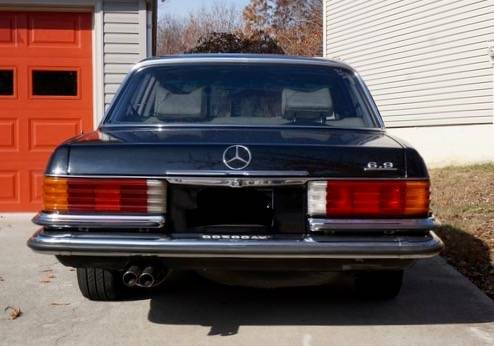 I have never seen an SEL with NO interior pix but multiple (7?) shots of the air cleaner. Was the car used to breed coyotes or wolves? Why talk about the Palomino interior if you can't see it? A: Shifty guy doesn't own the car, but found the hood unlatched (hence the buzillion engine compartment pix). Proceed with caution. Perhaps the ad lister will offer instructions on how to break the window and hotwire the car?